Select the appropriate Start and End date for which the Report will be run. The Report can range for the entire life-span of the company down to a single day. Filters are powerful tools, designed to enable you to view very specific information. 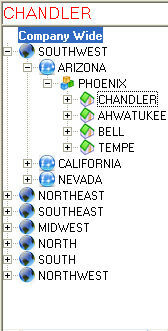 Select a specific Region, Market, District, or Location to filter information for the selected location entity. If you want to limit the Report output to that of a specific Transaction (or range of Transactions), simply enter their corresponding Transaction #(s) in the Start Transaction and End Transaction fields. The available filters for the Report will be presented when the Report is selected. Grouping allows you to organize and format reporting data in specific ways, further refining your reports. For example, a selection of ‘Location’ for the GROUP LEVEL will result in transactions to be reported by LOCATION. The ‘Group By’ option will create sub-groups beneath the Group Level. Continuing with the sample provided above, if the Group Level is set to ‘Location’, and the ‘Group By’ option to ‘Salesperson’, TeleTracker Online will automatically report Salesperson sub-groups beneath each given Retail Location. The available Grouping Options for the Report will be presented when the Report is selected.